In many ways, the pictures tell the story. There are snow-capped mountains and lush rainforests, kayaks full of adventurers and smiling groups under makeshift shelters. And there are images that only a particular type of audience could find enthralling — close-ups of frostbite, tropical skin disease and ghastly intestinal parasites. All of these and more were exhibited by speakers at a recent London conference on opportunities in expedition medicine. They illustrate the obvious appeal for doctors of accompanying groups of travellers to remote regions: a chance to visit beautiful places while honing your medical skills and clinical judgement. Dozens of medics attended the event, organised by the trainees committee of the Royal Society of Medicine, and more watched from Aberdeen via a live link. There was plenty of advice for all doctors about the possibilities of combining expedition medicine with conventional postgraduate training and NHS commitments. But there were also stirring words from one young doctor whose passion for expedition medicine and humanitarian work has prompted her to step off the traditional medical career ladder entirely — at least for the time being. SpR in pre-hospital medicine Amy Hughes graduated from Nottingham University medical school in 2003. At that stage, she had no interest in expedition medicine; in fact, she had barely travelled outside the UK. But as she progressed through her house officer jobs (now foundation years one and two), she began to wonder what the future held. ‘I was getting itchy feet, thinking: “What do I want to do? I don’t want to stay in hospital training”,’ she says. All around her, fellow medics were studying hard for exams. ‘I wasn’t the slightest bit interested in doing exams at that time,’ she says. So she decided to take a year out. It was not a move that attracted universal support; in fact, she faced dire warnings about how hard it would be for her to re-enter training, given the imminent introduction of ST (specialty training). Undaunted, she began researching opportunities in expedition medicine. Her first foray was with a social enterprise called Blue Ventures, which leads marine conservation projects in Madagascar and Belize. It was one of the few outfits willing to take on a doctor with no previous experience of expedition medicine. And it was to prove a valuable — and unforgettable — launch pad. During her year out, she also gained a diploma in tropical medicine and hygiene from Liverpool University. That stood her in good stead when she applied to return to training at Addenbrooke’s Hospital. Despite competing against people with more exam qualifications, Dr Hughes was able to convince the selectors that she was the best candidate. She says: ‘I talked about the skills I’d learned from the expedition world, the medical skills I’d improved on, how I’d had to become not just a medic but a multi-tasking individual — involved in logistics, decision making, team management, communication skill development, teaching and training.’ Dr Hughes believes her experience proves criteria have changed for those assessing trainee applicants. ‘They want an interesting, dynamic individual who’s going to be good at the job and work well with their peers,’ she says. While at Addenbrooke’s, she used her annual leave to join short Across the Divide expeditions to places including Namibia, and took a European masters in disaster medicine. By the time she was appointed to an ST2 post in the Severn Deanery in August 2007, her career was potentially mapped out: she could have stayed in emergency medicine training all the way to ST6. But within a couple of years — during which she completed six months in anaesthetics and six months in ICU as well as stints in acute orthopaedics and emergency paediatric medicine — she was dreaming of escape again. At a conference in Birmingham, she picked up a flyer advertising opportunities with one of Australia’s ‘flying doctor’ services. She negotiated an out-of-programme experience, which enabled the deanery to keep her training number open for a year, and headed off down under. That was in 2009. So far, she has not returned to training. The make-or-break moment came during her stint in Australia, when she successfully applied — via an email and a long-distance telephone interview — for a job with Kent’s HEMS (helicopter emergency medical service). After a ‘fantastic’ year in that role, she made the momentous decision to resign her run-through training number and follow her interest in humanitarian medicine. Dr Hughes has since spent seven months working with relief organisation Médecins Sans Frontières in the aftermath of civil strife in Sri Lanka, and now has a post with the London HEMS. In addition, she is medical director of remote medical training organisation Expedition & Wilderness Medicine. She says there is a huge amount to be learned from expedition medicine, but warns that no one should contemplate it unless they have a certain amount of postgraduate training under their belt. ‘When you’re in a hospital and you’ve got an ICU consultant, a paediatric consultant, an anaesthetist, an emergency doctor and an orthopaedics consultant next to you, fine; you can help treat the multiply injured patient as an F1 [foundation doctor 1]. Dr Hughes is uncertain what her future holds. But she knows that stepping out of training was the right think to do. ‘I took that risk and I have never looked back,’ she says. ‘I want to hold on to the immense passion I have for my work, which I think is often lost during standard training. ‘And I think the process of learning and the experiences I’m gaining are more important than the “end point” [of becoming a consultant] in making me a better doctor. ‘In four years I might go back to ST4. I’ll see. Massive congratulations and respect for our medical director Dr Amy Hughes for her graduation on the London HEM’s Team… we are very proud of her! 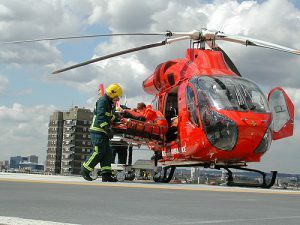 London’s Air Ambulance is the charity which runs London’s Helicopter Emergency Medical Service. The service provides pre-hospital medical care to victims of serious injury, at the scene of the incident, throughout London – serving the 10 million people who live, work and commute within the M25. Based at the Royal London Hospital and founded in 1989, the service is unique in that it operates 24/7, with the helicopter running in daylight hours and rapid response cars taking over at night. The Team, which at all times includes a Senior Trauma Doctor and a specially trained Paramedic, perform advanced medical interventions, normally only found in the Hospital Emergency Department, in time critical, life threatening situations. 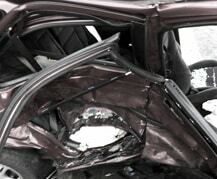 Missions commonly involve serious road traffic collisions, falls from height, industrial accidents, assaults and injuries on the rail network. London’s Air Ambulance has an international reputation for clinical excellence and delivers pioneering procedures which have been adopted across the world. with air & land based response; and to provide 24 hour cover. The EWM story you have the book now watch the film! 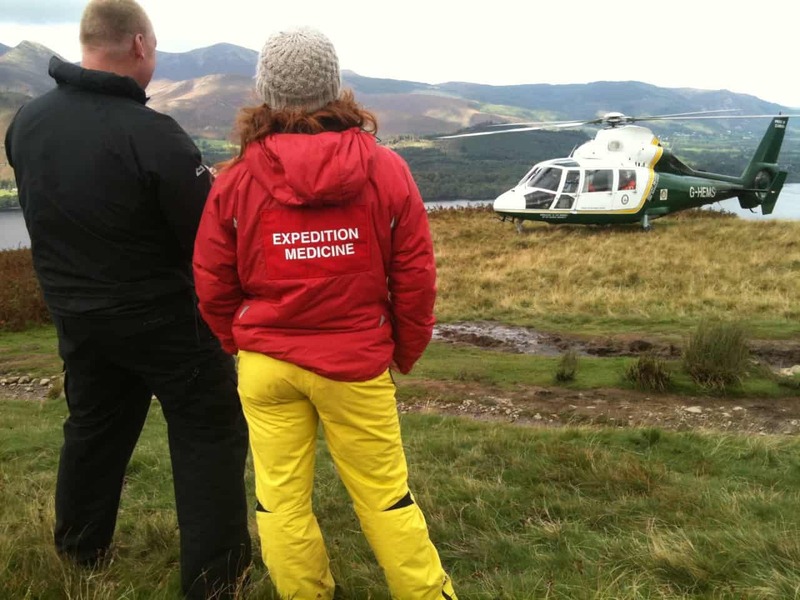 The Expedition and Wilderness Medicine course at the Plas y Brenin convenes today. An eclectic mix of delegates and faculty gather today at the National Mountain Centre in North Wales for what promises to be an amazing week. Kicking off the talks are Dr Amy Hughes HEMS medic for Kent Air Ambulance, Steve Jones polar base camp manager for Patriot Hills and now the new Antarctic Camp at Grand Union Glacier and veteran of large scale expeditions to Nicaragua, Chile, Costa Rica, Zimbabwe and Borneo to name but a few and Dr Martin Rhodes medic for Antarctic Logistics operations at the South Pole, resident of the Pyrennes and medic for numerous Bond movies. ﻿﻿﻿Dr Amy Hughes, Wilderness Medicine and Pre Hospital Care Expert | Wilderness Remote Medical training course. 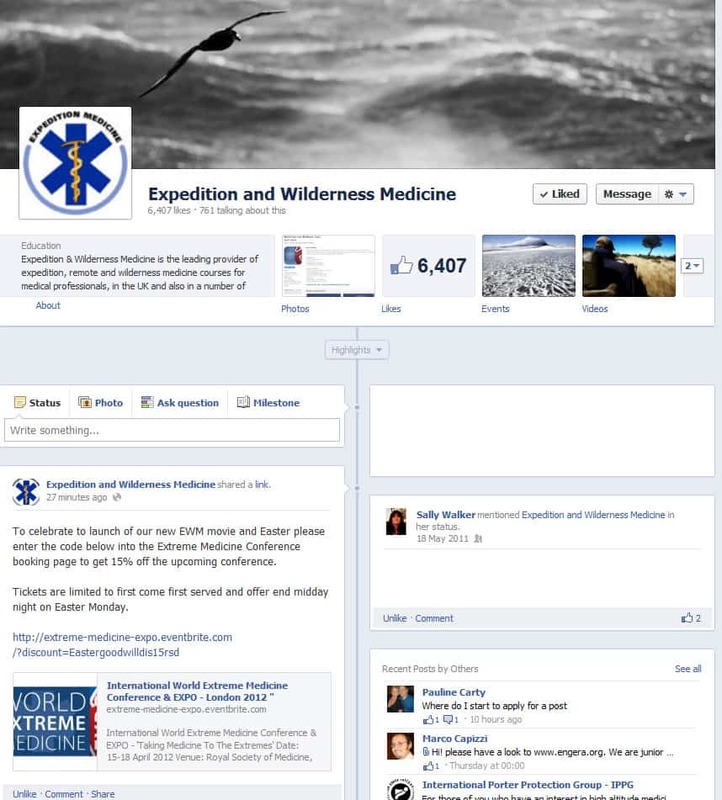 Steve Jones, Polar Logisitics and Expedition Expert | Polar and Cold Weather Wilderness Medicine CME training course. 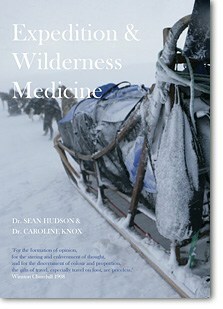 Dr Martin Rhodes, Wilderness Medicine and Cold Weather Medicine Expert | Remote Medicine Training Courses.